A salmonella outbreak in Rhode Island shows how tighter budgets impact health policies and protections. » Food Safety Budgets Suffer Across the U.S. Frequency of inspections drops across the country as states deal with budget shortfalls. From Hawaii to Rhode Island, cash-strapped state governments are cutting food safety programs. And that, public health experts say, is putting the public at risk. Only Montana and North Dakota managed to avoid budget gaps during the 2010 fiscal year, according to the California-based Henry J. Kaiser Family Foundation. Arizona was the hardest hit, with an estimated budget shortfall of more than $3 billion. Hawaii, which like Rhode Island relies exclusively on a state health department to inspect food establishments, had a $533 million shortfall. “[Rhode Island] will give you a picture of what’s going on in most states these days,” said Tony Corbo, senior lobbyist for the food campaign at the nonprofit Food and Water Watch in Washington, D.C.
“You’re getting what you’re paying for,” he said. Dr. Ernest Julian, chief of the Office of Food Protection at the Rhode Island Department of Health, said his seven inspectors made some 3,400 total inspections, visiting fewer than half of Rhode Island’s food service establishments last year. 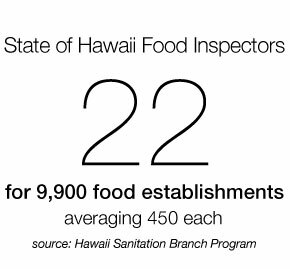 FIn comparison, Hawaii, with 9,900 food establishments, has 22 food inspectors. The state needs at least seven additional inspectors to keep up, according to Sanitation Branch Program Manager Peter Oshiro. In 2010, Florida’s state agencies gave up control over food safety inspections in hospitals, day care centers and nursing homes, according to the nonprofit Center for Science in the Public Interest in Washington. This means nearly 3,000 facilities will receive fewer inspections, now conducted by local agencies. “Food safety is one of the areas that should not be included in the across-the-board cuts,” said Patricia Buck, director of Outreach & Education at the Center for Foodborne Illness Research and Prevention in Pennsylvania. The U.S. Food and Drug Administration recommends that each inspector conduct 280 to 320 inspections annually, but there is no follow-up to make sure that happens. “The FDA does not track the number of state or local food service inspections,” FDA Public Affairs Officer Pat El-Hinnawy said in an email. In Rhode Island, Gov. Lincoln Chafee’s new budget proposes even more cuts, and legislators worry about food safety risks. “I’m sure that [he] can cut other places rather than cut public health,” said Rhode Island State Sen. John J. Tassoni Jr., who is pushing for the funds to hire more health inspectors.